These images are from Flat Connections, Global Digital Citizens, Langwiches Blog, Write our World and American TESOL Institute. This blog is about an intended project for my international English as a Second Language (ESL) students. These ESL students recently participated in the Flat Connections Global Project in semester 1. This semester, I want to build on their new technological skills to connect and to deepen their understanding of what it means to be a responsible global citizen. If we are really wanting to serve our students and help them to develop to become the leaders and learners of today and the future, taking risks in our practice is ..necessary. Through researching the topic of global digital citizenship and by making connections with other students, students will be engaged in discovering intercultural understanding. 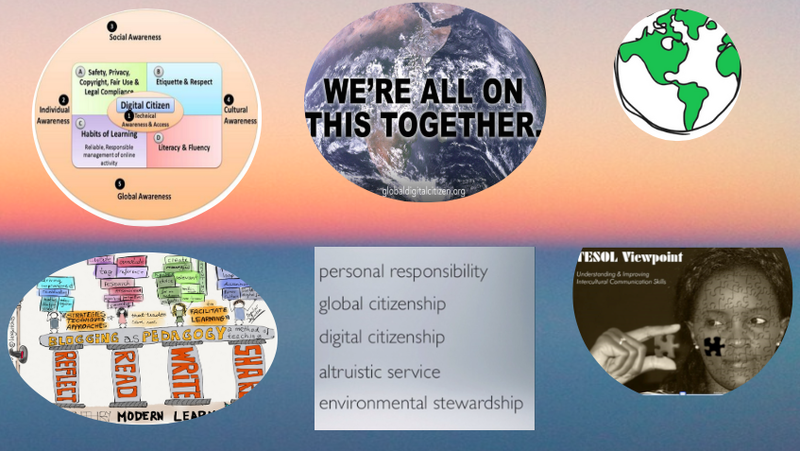 By using collaborative digital technologies – blogs, Google Hangout and iBooks- students will research what global digital citizenship means in theory and how they can become active responsible world citizens. Connect: Students will write a series of blog reflections based on class activities and their own research on global digital citizenship. These blogs will be hosted on My Class Edublog site and other schools will be invited to post comments and make connections. Collaborate: Through their blog comments, my students will respond and hence build connections and research other cultures. The aim is for students to take leadership and organize a Google Hangout on the topic of intercultural understanding and responsible global citizenship. Create: Here the aim is for students to create a collaborative iBook on the topic of what it means to be a world citizen. Recently, I read an article by Alyssa J O’Brien and Anders Eriksson, Cross-Cultural Connections: Intercultural Learning for Global Citizenship. The quote below describes the importance of taking risks, to use innovative, communicative technologies with our students to assist them in becoming safe and responsible global citizens. … crosscultural connections can foster greater political understanding, ethical awareness, and intercultural competencies in order to bring about improved international and social relations for emerging global citizens. As my students research and we curate our findings, I will post more resources and share. So far, the resources below have provided insight and guidance for my learning on intercultural understanding and global digital citizenship. American TESOL Institute: Understand and Improving Intercultural communication Skills. It’s About Learning: Horizon Report 2015 ISTE. Tagged collaborate, connect, create, flat connections, Global Digital Citizenship, Intercultural understanding, Julie Lindsay, Lee Crockett, Sonya. Bookmark the permalink. Hi Ann, this is a great project and I have a group of girls, most of whom were also in the Flat Connections project who would participate. Hi Anne, I’m so happy that you and your students can collaborate. Next week we will be back at school and will start our student blog ‘About Me’ pages. Such an exciting start to semester two. Looks great, Ann. Thanks for including us!